The aircraft carrier USS Saratoga, nicknamed Sara, had a long and distinguished history. 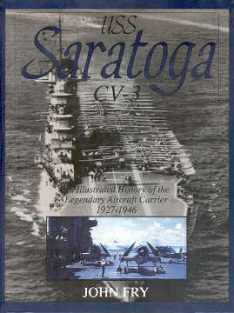 Commissioned on November 16, 1927, Saratoga was the oldest carrier to survive World War II. This ship history covering almost twenty years stands out for its high quality with regards to organization, research, documentation, printing, and photographs. After a chapter that covers the beginnings of Saratoga, the next 19 chapters tell the ship's history chronologically with each chapter devoted to the period when a new captain had command. The most famous captain, William (Bull) Halsey Jr., commanded the ship from July 1935 to June 1937 and eventually became Fleet Admiral after commanding the US Third Fleet against the Japanese. Sara had just completed launching fourteen fighters and a torpedo plane, when six Japanese planes were observed coming out of the clouds to the east. Sara's gunners opened fire. The first plane, hit and on fire, struck the starboard side, penetrating to the hanger deck and causing fires. 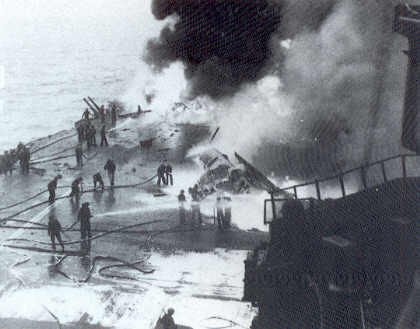 Kamikaze number two had also been hit by anti-aircraft fire and was in flames. It hit the water and bounced into the starboard side, bursting Sara's blister and causing a list of 6°. Plane number three was shot down clear of the ship. The fourth plane came up from astern and dropped a bomb, which bounced off the flight deck near the port bow. The next aircraft dove into the anchor-windlass room and exploded, creating a huge conflagration. The final bogey passed Sara's bridge to starboard and struck the airplane crane. A portion of the plane crashed into the #1 gun gallery, and the rest of the craft slid off over the port side, but not before its bomb exploded on the flight deck. This book does not mention the additional three kamikaze planes that attacked the ship an hour and a half later. The first two planes were shot down, but the third crashed into the flight deck after dropping a bomb (Rielly 2010, 180). The kamikaze attack killed 123 and wounded 192 men and destroyed 36 aircraft (p. 149). 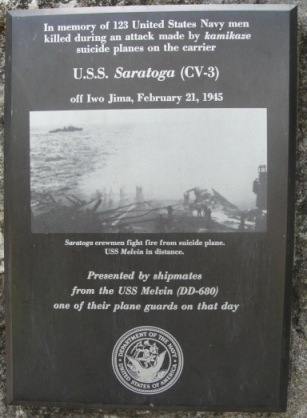 After the attack, the Navy decided to covert Saratoga to a training carrier due to her age and the extent of damage inflicted by the kamikaze planes. The book has an extensive bibliography (including interviews and correspondence with several Saratoga veterans), end notes, and index. Quotations from veterans throughout the book add color and interest to this focused historical summary of the ship and her air groups. However, the two pages on the kamikaze attack do not include any accounts from Saratoga crewmen. Rielly, Robin L. 2010. Kamikaze Attacks of World War II: A Complete History of Japanese Suicide Strikes on American Ships, by Aircraft and Other Means. Jefferson, NC: McFarland & Company.